BUYSOUNDTRAX presents William Malone's PARASOMNIA, featuring music composed by Nicholas Pike (SLEEPWALKERS, Stephen King’s THE SHINING, FEARDOTCOM, FREDDIE’S NIGHTMARES, Stephen King’s RIDING THE BULLET) for the 2008 horror thriller directed by William Malone (FEARDOTCOM, HOUSE ON HAUNTED HILL, CREATURE) and starring Cherilyn Wilson, Dylan Purcell, Patrick Kilpatrick, Jeffrey Combs and Timothy Bottoms. PARASOMNIA tells the story of Laura Baxter (Wilson), a young woman who suffers from a medical condition called parasomnia that is causing her to sleep most of her life away, awakening briefly on rare occasions, Laura is literally a Sleeping Beauty, her days passing into years while she sleeps in a room in a psychiatric hospital. Art student Danny Sloan (Purcell) immediately falls in love with Laura, unaware that her neighbor is a mesmerist and mass murderer named Byron Volpe (Kilpatrick), who has other plans for her. While Laura sleeps, Volpe has been using his powers to invade her dreams and make them nightmares. When Danny begins to believe in what is happening to Laura, he starts to make plans to get her out of the hospital before it’s too late and she loses her mind. Envisioning PARASOMNIA as a kind of dark modern fairy tale of horror, romance, obsession and death, writer/director William Malone wanted the film to have “an otherworldly quality, as though the story was adrift in time”. In his mind, he thought of great classical composers such as Gustav Holst, Ralph Vaughan Williams and Prokofiev. To score PARASOMNIA, Malone turned to composer Nicholas Pike to provide the musical glue for the film, continuing their creative collaboration that has included FEARDOTCOM, MASTERS OF HORROR and FREDDIE’S NIGHTMARES. Pike’s score for the film includes a delicate love theme for the lovers as well as aggressive and imaginative music for various undercurrents of Laura’s dream world. Born in Water Orton, Warwickshire, England in 1955, Nicholas Pike started his music career at age seven when he auditioned for and was accepted to the prestigious Canterbury Choir School in England. There, aside from singing in the choir, he was required to learn two instruments: one had to be the piano; Nicholas chose the flute as his primary instrument. His family moved to South Africa where he continued his music studies, eventually becoming Head Chorister at St. George's Cathedral in Cape Town. As a teenager, he was asked to sub for the flute chairs with the Cape Town Symphony Orchestra. During this time, he also became involved with HAMMAK, one of South Africa's best known bands. This led to a world of composing and playing music from R&R to improvisational jazz. After finishing high school, Nicholas came to the U.S. to study at Berklee College of Music in Boston, majoring in Composition. During his time in Boston and New York, he wrote for and played flute with various bands whose members spanned music greats Bill Frisell, Billy Hart, Hank Roberts, Bill Connors, Nana Vasconcelos and Kenny Werner, among others. In 1985 he conducted the London Symphony Orchestra in a recording of his MASTER HAROLD AND THE BOYS Suite, originally composed for a film version of playwright Athol Fugard’s apartheid drama. He recorded the orchestra at Abbey Road Studios in London and this led to him scoring his first movie, GRAVEYARD SHIFT, in 1986. He subsequently moved to Los Angeles where he continues to score films as well as compose and conduct for high-profile television projects and music videos. Nicholas Pike is known for his innovative use of instruments and sounds to create music. For example, in Stephen King's thriller, SLEEPWALKERS, he used the rubbing of a crystal wine glass to generate an edgy, metallic sound simulating the cats' wail. When the monster appears in the film, Pike uses a sampled Tibetan mountain pipe played two octaves below its original range giving it an unsettling kind of growl. This technique created the “instruments” with which he delivered his thematic ideas for the project. Exhibiting a wide stylistic range and facile command of both orchestral and electronic composition, Nicholas Pike has become one of the most sought-after composers in Hollywood. His ability to work in creative partnership with a film's director, as well as his skills as an arranger, conductor and engineer add to his appeal. His music has been featured in films such as CAPTAIN RON, the 1993 remake of ATTACK OF THE 50 FT. WOMAN, the 1997 television miniseries version of Stephen King’s THE SHINING, BLANK CHECK, STAR KID, RETURN TO ME, FEARDOTCOM, THE I INSIDE, Stephen King’s RIDING THE BULLET, the 2008 remake of IT’S ALIVE, BLOOD AND BONE and, most recently, WRONG TURN AT TAHOE. His music has also been featured in several television shows, including ALFRED HITCHCOCK PRESENTS, FREDDIE’S NIGHTMARES, EERIE, INDIANA, TALES FROM THE CRYPT, LIFE WITH BONNIE and MASTERS OF HORROR. He was recently hand-picked by actress/comedienne and talk show host Bonnie Hunt to create and lead the first-ever daytime talk show live band for THE BONNIE HUNT SHOW, airing on the NBC network. Nicholas also composed and scored the theme for THE BONNIE HUNT SHOW. Nicholas has scored large scale music videos like Michael Jackson's GHOST and Will Smith's WILD, WILD WEST and he also won the Elmer Bernstein Award for his score to LOVE OBJECT at the 2003 Woodstock Film Festival. 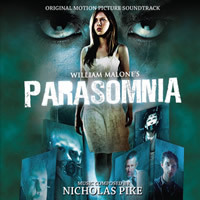 BUYSOUNDTRAX Records presents the original motion picture soundtrack to PARASOMNIA, featuring music composed by Nicholas Pike. The booklet features notes by director William Malone and the music has been professionally mastered by James Nelson of Digital Outland. PARASOMNIA is a limited edition of 1000units. The first 100 copies sold through our website will be autographed by composer Nicholas Pike and director William Malone. PARASOMNIA is available for pre-order at www.buysoundtrax.com and is expected to start shipping on June 8th, 2011.